Here’s a curious thing, a Young Adult novel written by Carl Hiaasen. 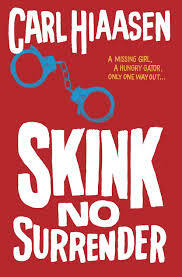 Skink: No Surrender takes Hiaasen’s most iconic character, his one-eyed man mountain environmental avenger Skink, and hooks him up with some troubled teens. It’s an interesting idea, the charismatic Skink is the kind of dangerous antihero you’d probably except anxious teenage boys to adopt as substitute fathers in order that they can learn a valuable lesson about the desecration of the natural world. Typical Malley – to avoid being shipped off to boarding school, she takes off with some guy she met online. Poor Richard – he knows his cousin’s in trouble before she does. Wild Skink – he’s a ragged, one-eyed ex-governor of Florida, and enough of a renegade to think he can track Malley down. With Richard riding shotgun, the unlikely pair scour the state, undaunted by blinding storms, crazed pigs, flying bullets and giant gators. Skink has become Hiaasen’s signature character, an elemental force of nature. The former Governor of California, Clinton Tyree went feral years ago, retreating into the wilderness to exact brutal revenge on the more stupid polluters around Miami in half a dozen adult novels, beginning with Double Whammy way back in 1987. It’s the environmental message that will really appeal to young readers, I guess, but Hiaasen and YA seems a bit of an awkward fit to me. This is Hiaasen pulling his punches and a lot of the wry nastiness of his adult novels – mouldering pitbull heads attached to limbs, and suchlike – is missing, when a few more repellent turn of events would probably hugely appeal to young male readers. No Surrender is a bit – well, nice, dude. The plot, in which Skink and Richard head down river to save the boy’s cousin from an internet predator, never really gets blown off course into unexpected tributaries. The antagonist is a dim, mouthy cry baby. But this being Hiaasen, the banter – the back and forth between the characters – is always terrific, and the middle section of the book, with the four leads trapped on a houseboat in the wilderness, is a terrific exercise in pacing. Skink is a fabulous character, there’s no doubt about that, and there are more YA novels to feature the character on the way, apparently. But part of what makes Skink so singular is his insane conviction, and it seems to me that injecting a bit more of Hiaasen’s trademark exuberant comic malevolence would surely appeal to young adults of every age. Many thanks to Indigo for the review copy of Skink: No Surrender. 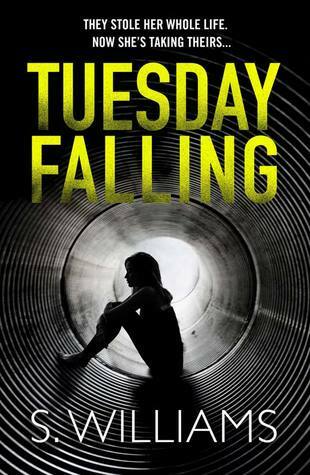 This entry was posted in Books, Reviews, Young Adult and tagged Carl Hiaasen, Double Whammy, Skink No Surrender, Young Adult on October 10, 2014 by Crime Thriller Fella.